Once you arrive at Narita Airport, look for the Japan Rail Pass Ticket Office to exchange your JR Pass voucher and reserve a seat on the next Narita Express train to Tokyo. The trip takes about an hour. Tokyo has several sakura viewing sites that you can explore on your first day of sightseeing. Shinjuku Gyoen – With hundreds of cherry blossom trees scattered all over its spacious lawns and gardens, Shinjuku Gyoen is one of the most popular cherry blossom viewing spots in the city.Take the JR Chuo/Sobu Line to JR Sendagaya Station, and walk about five minutes to the garden’s Sendagaya Gate. Chidorigafuchi – Here you can enjoy a relaxing boat ride on a moat while you take in the views of beautiful canopies of pink cherry blossoms.Located near the Tokyo Imperial Palace, Chidorigafuchi is a 20-minute walk from JR Ichigaya and JR Iidabashi Stations, which can be accessed via the JR Chuo/Sobu and JR Chuo Lines. Koishikawa Korakuen – A traditional Japanese garden built during the early Edo times, Koishikawa Korakuen is home to numerous weeping cherry trees that welcome you at the garden’s main gate.Take a JR Chuo Line train and alight at JR Iidabashi Station. From there, the garden is only a five to ten minute walk away. Bokutei Cherry Blossom Festival – Held along the banks of the Sumidagawa River, the Bokutei Cherry Blossom Festival features a one-kilometre tunnel of sakura trees in full bloom. This annual event is usually observed around late March to early April.To get to the festival site, take a JR Yamanote, Keihin-Tohoku, Joban, Takasaki, or Utsunomiya Line train going to Ueno Station, and then transfer to a Ginza Line train headed to Asakusa Station (the Ueno to Asakusa stage of the journey is not covered by the JR Pass and it costs 170 yen for a one-way ticket). Ueno Cherry Blossom Festival – Held from late March to early April, the Ueno Cherry Blossom Festival at the Ueno Onshi Park offers an opportunity to view the stunning sakura blossoms both during the day and at night, when a thousand lanterns illuminate the park.From JR Ueno Station, the park is only a two-minute walk away. Outside Tokyo, there are also many highly recommended cherry blossom viewing spots that you can visit. Yokohama Sankeien Garden – A spacious garden that features Japanese style landscaping and architecture, the Sankeien Garden contains many historic structures, such as the main hall and the three-storey pagoda of the old Tomyoji Temple that used to be in Kyoto.From Tokyo Station, board a JR Keihin-Tohoku Line train to Yokohama Station and then take the JR Negishi Line to Negishi Station. The walk to the garden takes about half an hour. Yokohama Ookagawa River – A popular activity in spring is strolling along the five-kilometre tunnel formed by dense blankets of cherry blossoms on the banks of the Yokohama Ookagawa River.The spot can be easily be accessed by walking from JR Sakuragicho Station, which is on the JR Negishi Line. Yokohama Minato Mirai 21 – Even in the middle of a bustling urban area, Minato Mirai 21 has great cherry blossom viewing spots. The site is also located close to JR Sakuragicho Station. Mt Fuji – The northern base of the mountain is where you can find the famous Fuji Five Lakes, which all have amazing cherry blossom spots that tourists flock to in spring.Board a JR Chuo Line train going to Kawaguchiko Station and then use the tourist buses (not covered by the JR Pass) to travel around the area to explore the lakes. Kamakura – In addition to its many historical and cultural spots, Kamakura is also a popular destination for cherry blossom viewing. 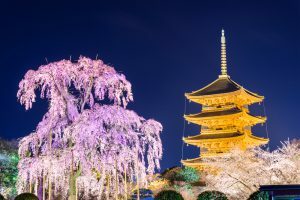 Some of its most popular sakura spots are the Tsurugaoka Hachimangu Shrine, Kamakura Daibutsu, and Genjiyama Park.From central Tokyo, you can reach Kamakura by taking the JR Yokosuka or JR Shonan Shinjuku Lines. The one-way trip takes less than an hour. Kanazawa was home to the Maeda Family, the second most influential and powerful feudal lords during the Edo Period. Today, it is a very popular tourist destination as it offers a wide array of cultural and historical spots that date back from that eventful era. It also is home to several top-notch sakura viewing spots. From Tokyo Station, take a Shinkansen to Kanazawa Station. The one-way journey takes about three hours and is entirely covered by your JR Pass. Kenrokuen – Regarded as one of the three most beautiful landscape gardens of Japan, Kenrokuen is a spacious garden with a diverse collection of flowering trees, plants and shrubs. Kanazawa Castle’s Ishikawamon Gate – Both sides of Kanazawa Castle’s Ishikawamon Gate are lined with beautiful cherry trees that are a fantastic sight when in full bloom. Asanogawa Ohashi Bridge – With views of the Asanogawa River, a stroll along the Asanogawa Ohashi Bridge is popular during peak sakura season. This vantage point will allow you to enjoy scenery blanketed in pink cherry blossoms. Mt Utatsu – Mt Utatsu is home to a park with numerous cherry trees and offers overlooking views of Kanazawa and the surroundings. A direct train linking the two cities of Kanazawa and Kyoto makes travel very convenient. From Kanazawa Station, take a Ltd Exp Thunderbird train to Kyoto Station. The whole trip takes a little over two hours and is fully covered by your JR Pass. Philosopher’s Path – Strolling the entire two-kilometre length of the Philosopher’s Path is quite popular during the sakura season, as the concrete walking trail is lined by gorgeous cherry trees from start to finish. Arashiyama – Located in Kyoto’s outskirts, Arashiyama is a busy yet uplifting district that has many varieties of cherry trees scattered all around. 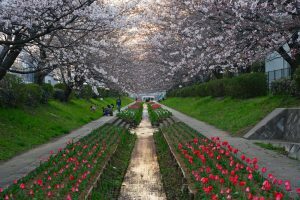 Maruyama Park – A public park that is known for its sakura parties, Maruyama Park is always crowded during the peak cherry blossom season, especially at night when it holds sakura illuminations. Outside Kyoto, there are also some cherry blossom viewing spots that are worth visiting. Kema Sakuranomiya Park (Osaka) – The Kema Sakuranomiya Park is a riverside park that has lush and rich natural scenery, with around five thousand cherry trees that look amazing during peak blooming season.From Kyoto Station, take the JR Special Rapid Service train to Osaka Station and then transfer to the Osaka Loop Line going to Sakuranomiya Station. The park is a few minutes’ walk away. Mount Yoshinoyama Park (Nara) – For many centuries now, Mount Yoshinoyama Park in Nara has been a highly-regarded cherry blossom viewing spot. 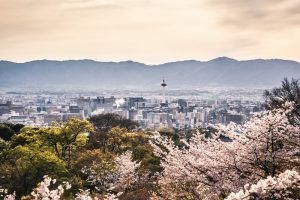 It is covered by around 30,000 cherry trees of different varieties.The fastest way to get there from Kyoto is by taking the Kintetsu Ltd Exp to Kashiharajingumae Station, and then transferring to the Tourism Ltd Exp Blue Symphony Line to Yoshino Station. From there, get on a shuttle bus to Naka Senbon Park. If you want to go deeper into the sea of cherry trees, there is a mini bus route to the Oku Senbon area. The whole trip takes about three hours and is not covered by the JR Pass. Nara Park (Nara) – To enjoy both freely roaming deer and beautiful pink cherry blossoms, visit Nara Park, which is about a 20-minute leisurely walk from JR Nara Station.From Kyoto Station, take the JR Nara Line Rapid Service to Nara Station; the trip takes about three-quarters of an hour. A daytrip to Himeji is a must to see the world-renowned castle and experience the city’s local cherry blossom viewing culture. Himeji Castle – Widely regarded as the most beautiful surviving castle of feudal times, Himeji Castle is a national heritage site that is also a popular spot for cherry blossom viewing.From Kyoto Station, Himeji Station is only a 45-minute Shinkansen ride away. Then, from Himeji Station, walk about 15 to 20 minutes to reach the castle. 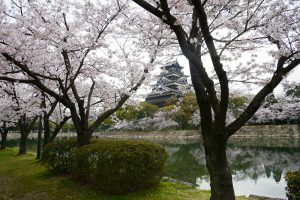 Hiroshima has some sakura viewing spots that will take your breath away, particularly the Hiroshima Castle complex. Hiroshima Castle – A castle town constructed towards the end of the 16th century, Hiroshima Castle used to be the home of powerful Western Japan feudal leader Mori Terumoto. It consists of a five-storey main keep, a moat, and a large garden that is home to numerous cherry trees.From Kyoto Station, take a Shinkansen to Hiroshima Station. Then, hop on tram line 1, 2 or 6 (not covered by the JR Pass, one-way ticket costs 160 yen) to Kamiyacho-higashi or Kamiyacho-nishi stop. 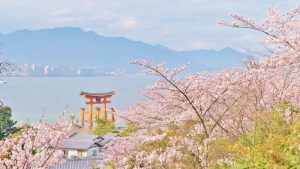 Not too far from Hiroshima is the island of Miyajima, which is also an excellent place to experience cherry blossoms in peak bloom. Miyajima – Famous for its large, seemingly floating torii, Miyajima has approximately 1,300 cherry trees scattered around Itsukushima Shrine and its hiking trails.From Hiroshima Station, board a train on the JR Sanyo Line going to Miyiajimaguchi Station, which is a short walk from the pier for ferries to Miyajima Island. Both the train and ferry are covered by the JR Pass. Next city on the itinerary is Hakone, which is about a four and a half hour train trip from Hiroshima. From Hiroshima Station, take a Shinkansen to Shin-Osaka Station and then transfer to another Shinkansen to Odawara Station. This part of the journey is fully covered by the JR Pass. Then, at Odawara Station, buy a Hakone Free Pass that costs 4,000 yen (valid for 2 days) to get unlimited use of certain buses, cablecars, trains, boats and ropeways within the Hakone area. To go back to Tokyo, use your Hakone Free Pass to travel from Hakone to Odawara. Then, from Odawara Station, have your JR Pass ready to take a 35-minute ride to Tokyo. Spend the rest of the day checking out the Tokyo sakura viewing spots that you missed during your first couple of days! Reserve a seat on the Narita Express at a JR Ticket Office at Tokyo Station or one of the other major JR train stations in Tokyo. The journey to the airport should take less than an hour. 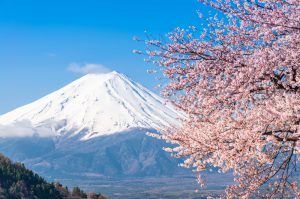 Note: Peak cherry blossom season varies per region every year, so be sure to check the internet for cherry blossom forecasts and reports so you can plan your trip accordingly.